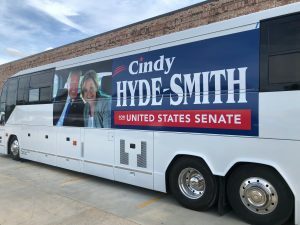 Team Cindy is hitting the road in the ‘MAGA Wagon’ to visit with voters from all corners of Mississippi! Have you had the chance to meet Senator Hyde-Smith and talk the issues? Follow along for updates and check the schedule below for more information. Introducing the MAGA Wagon — She’s forty-five feet long, holds twenty people, and one U.S. Senator who’s ready to hit the road!